Dental retainers are used following orthodontic treatment to prevent teeth from moving out of position. They form a key part of our teeth straightening treatment. There are different types of dental retainers available for patients to choose from. Some are fixed onto the back of the teeth, but many people prefer to wear a removable retainer made from a combination of plastic and metal. In most cases, retainers need to be worn constantly for the first 6 months after orthodontic treatment and then for a set period of time each day after that. We will advise you on how and when to wear your retainer. Not all patients will need to wear a retainer for a long time, but others may be advised to use a retainer for several years. 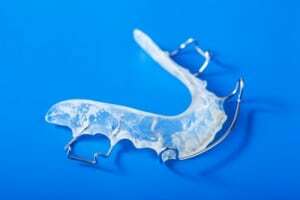 Why are dental retainers important? They are essential following orthodontic treatment because they help to maintain the new position of your teeth. After months of wearing braces the last thing you want is for the good work to be undone. Dental etainers are recommended for all patients because though braces move the teeth into a new position, it takes a long time for the teeth to finally settle. This is because the muscles, bone tissue and gums have to adapt to this change. Retainers will be custom-made for each patient and should fit comfortably. It is important to look after your retainer to prevent any damage and keep your mouth as clean as possible. If you have any questions about orthodontic treatment or retainers, please get in touch with our dental team in Melbourne.